I was eating my mango out from its gigantic seed, yeah, similar to what the baby in the photo above looked like and it suddenly hits me that it brings back childhood memory. I have not done that for a long time, mango was supposed to be served delicately taken out from its two beautiful cheeks but eating the delectable fruit directly out from the bone has been disregarded. So last night, I got my hands dirty and start devouring the not even the sweetest mango and it suddenly reminded me when I was a little girl. It was a good feeling. I remembered that when I was a little girl, I have my parents and they’ve provided for me. I could also reminisce that we have a house cook then who made sure that she emphasized that she prepared two dishes that I love. I never worry about anything because I was taken cared of. It was really a beautiful feeling for doing such a simple act. What about you? What experience makes you curl up and enjoy feeling like a kid again? Time has passed and I’m all grown up. My parents are gone and I have to cook my own food now unless I go to a restaurant. But you know what didn’t change all this time who loves us all throughout our life? God. He loves you and me, no matter our age, no matter our circumstances, and it’s a beautiful feeling that it doesn’t have to end with unknown when I rekindle a happy old feeling, because today I know that God is with me, making me feel at peace and would love to see me joyful and spreading positivity. 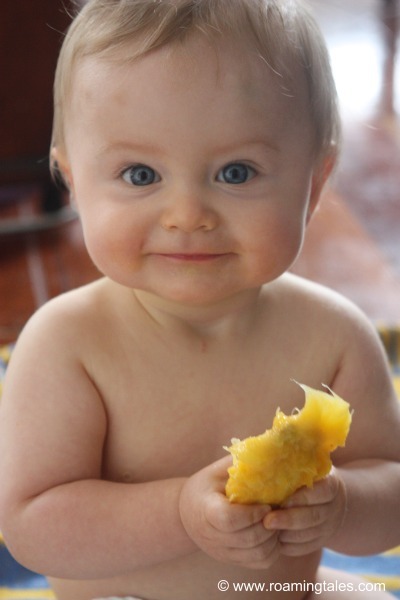 Hi, it’s a kind of great fun eating the whole mango without cutting it into cheeks and pieces. We used to this kind of eating since childhood. And we have many varieties of mangos most of which are full of juice and need to be eaten whole drawing the juice with your mouth. You can’t cut it. Otherwise all juice gets spilled. Other varieties also can be eaten whole and have fun.